The Svensson children are back! The last time we met the family, they told us how they celebrated Lucia Day on December 13th in Ewa Rydåker's previous book "Lucia Morning in Sweden." 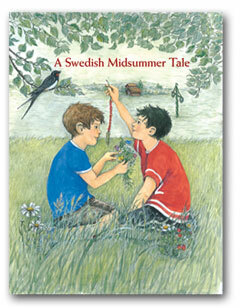 Her new book, "A Swedish Midsummer Tale" is a fun, educational book about the Midsummer celebration and how the Svensson children welcome their American cousin David who comes for the first time to visit his relatives and to celebrate this popular summer holiday in Sweden. Standard shipping rate to all continental 48 states. Contact our customer service for the exact shipping cost to other U.S. locations and Canada.